More than 90 percent of Ghanains shop at the West African nation's many open-air women. And that means, in most cases, buying from women, who dominate the trading business. But that power came at a price a generation ago, when the market women were blamed for an economic crisis and their livelihoods destoyed. What is the actual cost of a high school education in Ghana? The cost to attend high school varies around the world. Reporter Yepoka Yeebo tracked down the specifics of Ghana's high school fees to see why it's so challenging for kayayei, or "carry-girls" to afford an education. Waves of women and girls from Ghana’s impoverished north have been going to big cities to earn money, often to pay school fees. In the capital Accra, one tribal chief is trying to take care of thousands of them. 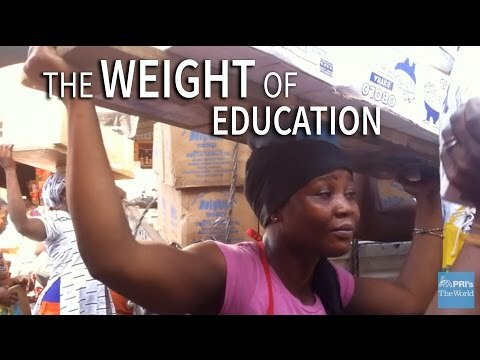 In Ghana, girls and young women from the rural countryside make up the largest group of people flooding into big cities looking for work, often to pay school fees. Most of them find work in the markets. But it's a rough life with few guarantees. You've seen the new iPhone 6. You want one. You buy one. So what do you do with your old iPhone to make sure it doesn't end up in some e-waste toxic pile in West Africa? We've got a few recommendations from an e-waste expert. Samy Ben Redjeb is a former flight attendant in Frankfurt who spent years flying to African countries, collecting music. That collection forms the basis of his record label, Analog Africa. His latest compilation CD is "Afrobeat Airways 2." The dance form, which has popped onto the Ghanaian music scene in the past year, calls for dancers to sort of act out their occupation. The World's Alex Gallafent profiles New York-based Ghanaian rapper Blitz the Ambassador. Blitz raps in several languages and his subject matter is out of the ordinary too. One some is about the IMF. In the West African country of Ghana, children's books that actually reflect African children are relatively new. The World's Carol Hills has more. Voters in Ghana head to the polls this weekend and leaders hope the election will be an example of democracy at work in Africa. The World's Laura Lynch reports from Accra. Barack Obama will head to Ghana Tomorrow in his first visit to Sub-Saharan Africa as president. Joining The Takeaway from Accra, Ghana, to discuss the emotional and political implications of the president's visit is David Amanor, from BBC Network Africa. As Ghana prepares for President Obama's arrival, excitement is running high among Africans both in Africa and in the U.S. Will Ross, BBC correspondent, joins us to set the scene for President Obama's first official trip to Sub-Saharan Africa. Increasingly, used electronics are winding up in Africa, and Africans are paying a price – with their health.